Nothing fishy about this recipe here! Lump vegan crab cakes with jackfruit, corn, and green onions. 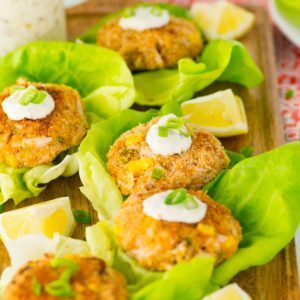 Paired with tartar sauce, this recipe will have vegans and vegetarians swooned! Make flax egg: Mix ground flaxseed and water and let sit for 5-10 minutes. Drain jackfruit and put in a large mixing bowl. Using hands, break apart jackfruit chunks, discarding any seeds or seed casings. Add remaining ingredients minus canola oil for crab cakes into mixing bowl and mix well with a rubber spatula. Pour some breadcrumbs (about 1/4 cup) and Old Bay spice (about 1 teaspoon) onto a plate. Mix well. Using a 1/4 cup, scoop out crab cake mixture and form patties with hands. Roll in breadcrumbs, ensuring both sides are coated evenly. Place a nonstick pan on medium heat. Once hot, add 1/2 teaspoon canola oil and place patties onto the pan. Let cook 3-4 minutes on each side. I like to cook no more than 2 at a time. Add 1/2 teaspoon more oil between each round of cooking. Mix together all ingredients for the sauce. Adjust seasonings as needed. Serve jackfruit cakes warm on butter lettuce. Add fresh lemon juice and server with tartar sauce. For tartar sauce: If you'd like, you can use chopped dill pickle instead of relish. I'd recommend adding a tiny bit of sugar to balance it out!